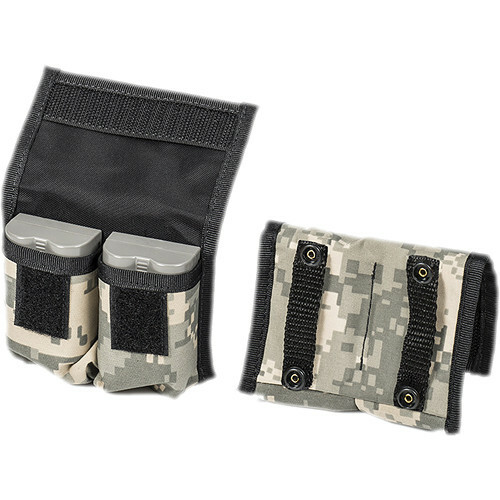 The digital camo BatteryPouch DSLR 2+2 from LensCoat consists of two pouches that each hold two lithium-ion batteries. Both pouches snap together to hold the batteries for easy storage and retrieval. Each pouch seals with a touch fastener. When not utilized, they fold flat for storage within your gear bag or luggage. A belt loop gives you quick access to the batteries and eliminates having to search through your shoulder bag or backpack. The pouches are made from a waterproof poly twill and nylon material. The digital camo is an advanced computer generated camouflage pattern. It is modeled after the U.S. Army's standard-issue ACU pattern, which provides a pixelated pattern that maximizes visual break up. The pattern, constructed from small rectangular pixels of color, mimics naturally occurring dappled textures and rough boundaries. BatteryPouch DSLR 2+2 (2-Pack, Digital Camo) is rated 4.8 out of 5 by 99. Rated 1 out of 5 by wilpenusa from Not what I expected! I ordered this to hold spare batteries that I don't have covers for. If you are planning to put EN-EL3s or any battery that has unprotected contacts exposed this holster does not protect, it had metal brads or rivets in the back to hold belt loops in place. They are covered with light cloth which may wear away at some point in time leaving the metal exposed inside the holster inline with the battery contacts. If you turn the battery around so the contacts are away from the metal rivets then the corners that have notches for alignment of the battery in the charger get caught on the trim of the holster. the holster is not big enought to hold the battery with the plastic safety cover on it. I'm rating the battery holster at ZERO! but I had to add a star just to appease the required minimum. Rated 5 out of 5 by jeb from Love these pouches I use them to hold various camera batteries (i.e. for the Nikon D800, D810, D750, Sony A7, Leica X Vario, Leica M-E, Leica D-Lux), and also AA and AAA batteries. These pouches are strong and secure. The flaps easily close with velcro, and they stay closed until you pry them open. They nicely clip on the back of another pouch, so you can store up to 4 camera batteries with one unit. They easily fit in a backpack or small camera bag. The pouch is made of some kind of material that makes it easy to label with an oil marker, so I know which batteries I'm carrying. All in all, a very strong pouch that is worth it's price. Rated 5 out of 5 by Monopod from Versatile protection I have put these on my belt and fit it onto others' gear on several commercial shoots. It holds most camera batteries 1 per sleeve, 2 AA per sleeve, 4 AAA, 2 9 Volt, 1 D, etc. There are a lot of benefits to this: + Keeps batteries from interacting and creating a nasty acidic mess. + Protects expensive rechargeable batteries from the elements and from being misplaced. + Provides easy access so replacement can be fast and efficient. + They can clip together for being placed in a pouch, and also have a small belt loop to be strung through standard belts. + The yellow border makes finding them a breeze. Highly recommended! Rated 5 out of 5 by LS from Perfect for EN-EL15 batteries Bought this as a 2-pack. Use one to hold 2 Nikon EN-EL15 batteries and the other holds a battery and a small GPS unit. They snap together back to back or can be threaded onto a belt or strap. Terminals are protected from accidental contact and product edges are nicely bound in easy to see hi-vis yellow fabric tape. Fabric tape ends are heat sealed to prevent unraveling and stitching is bar-tacked at seam ends. An overall well-made product that does what it is intended to do. Rated 5 out of 5 by James from Perfect! I used to keep my spare batteries, with their yellow contact protectors attached, in gym socks. That worked, but was a bit too bulky. These pouches are great. My Canon 5D Mark IV batteries fit in the pouch with or without the contact protectors attached. I think I'll leave the contact protectors at home. I like the belt loops. I usually wear a fanny pack to carry memory cards, spare batteries, tele-converters etc., but I may start leaving it in the car and putting the pouch on my belt and the cards in my pocket. if I think I'll need something else, like a tele-converter, then I'll put the fanny pack on. Rated 5 out of 5 by mmount from Great for Fuji X-T1 battery and Flash storage I use these for storing my spare X-T1 batteries and the flash so they aren't floating around in the camera bag. The flash fits a little snug but not too snug. The batteries are nicely loose fitting. I wish they had built in a tab or something that could have been used to indicate a full or expended battery. Personally I put the battery terminals down to indicate full and up to indicate expended. Rated 5 out of 5 by En from Excellent They're great snapped together or separated. I use them with Fuji and Sony batteries for the XT1 and the a7II respectively. Rated 5 out of 5 by Bird Photographer from Great Product!!!!! The Battery Pack DSLR 2+2 is a great idea and another fine product produced by lenscoat! As a professional photographer, I am always searching for my stuff. I seem to always throw stuff back into my bag haphazardly. With this product I can now store my batteries for my 5DIII and always know where they are. Compact and lightweight. Great to store batteries when flying as well!!! Highly recommend. will this fit Sony NPFM 500H? Sorry, but I don't know the answer to your question. I use Canon LP-E6N batteries &amp; this envelope fits them beautifully. I hope this helps you find your answer. Will this case accommodate the Canon LP-E8? Unfortunately the manufacturer does not list the batteries dimensions so I base my conclusion on the dimensions of the box that the LP-E8 ships in which is 6.8 x 2.3 x .08 vs the shipping box for the LP-E5 which is what this pouch was made for which is 3.2 x 2.0 x 1.0 . Conventional wisdom would imply that the LP-E8 is about 2-3 longer than the LP-E5. B&amp;H would probably be willing to check it out if you. Call them. They have excellent and knowledgable staff that have always answered any questions I've had in the past. Can I keep the battery covers attached and still use the battery holder? Yes, fits my LP8 just fine, and also fits LP6 -- I have both kinds of batteries. Will these pouches hold an EN-EL15 battery? My camera uses EN-EL9a and 2 of them fit just fine in one pouch. If the EL15 isnt much bigger I would say yes. Will a Sony np-fv70 fit in this pouch? Will it fit the Olympus BLH-1 Battery for the new OMD EM-1 MKII? Don't know for sure. I use mine to store extra Canon LP-E6 batteries (for 5D, 7D, 6D, and 60D). Since my Canon bodies are much larger than your Olympus body, I assume their batteries are larger, too, so I image this should work just fine (Might even be a bit large. ).